Russell Moore, chef and owner at Camino restaurant in Oakland, gave us this technique for grilling chicken breast--and it's the juiciest version we've ever had, protected from overcooking by the bones and skin. "Don't cook it too fast," he adds. "You don't want it burnt outside and raw inside." We also like his clever way of producing an entire dinner over one fire, grilling everything in sequence. 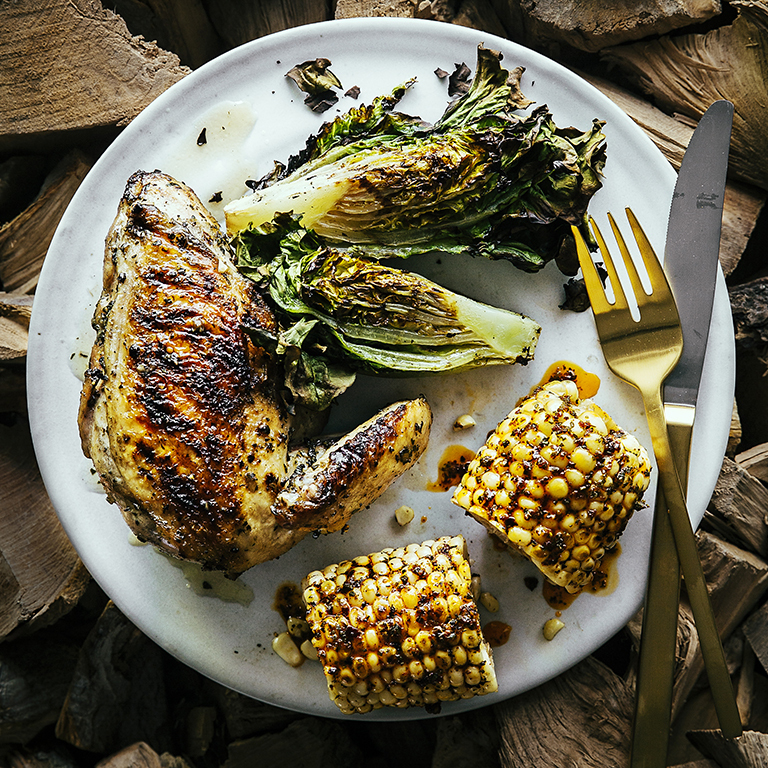 At Camino, he uses cherry and almond wood, but for the home griller, he suggests a mix of mesquite hardwood charcoal and either fruitwood or hardwood chunks--and lighting more charcoal partway through cooking. Remove chicken from refrigerator 2 hours before grilling; pat dry. Season all over with 1 tsp. each salt and pepper. With a mortar and pestle, pound garlic to a smooth purée. Add 1/2 cup oregano and pound to a coarse paste. Drizzle in just enough oil to make a thick paste, about 1 tbsp. (Or, mince garlic, then mash with the flat side of a chef's knife. Mince oregano and blend with mashed garlic and oil.) Rub paste all over chicken pieces (anytime after seasoning step). Ignite a heaping chimney of mesquite hardwood charcoal on firegrate of a charcoal grill. When fully lit but not quite glowing, about 15 minutes, spread about 1 in. thick over most of firegrate, but sloping up toward one side; the high part will be your hot area. Add about a half-chimney of unlit fruitwood chunks evenly to charcoal. Set cooking grate in place. When flames have burned down to low flickers, 5 to 8 minutes, you are ready to cook. Meanwhile, remove stems but not seeds from chiles. In a clean coffee grinder, grind chiles to a coarse powder. Finely chop remaining 1/2 cup oregano and mix in a bowl with chiles. Mash in butter, plus pepper and salt to taste. Grill corn in husks over hot part of fire, turning often, until blackened all over, 10 to 12 minutes; set aside. Light another chimney of charcoal in a heatproof area and let burn until glowing. When grill temperature is down to medium (about 400°), scrub cooking grate with a grill brush, then wipe grate with a clean, dry rag to remove soot. Arrange chicken over cooler part of fire, skin side down and with thickest part nearest hot area. Set a couple of plates on chicken to flatten and help it crisp. Grill, uncovered, until well browned underneath, 10 to 12 minutes. Meanwhile, prep lettuces: Quarter each head lengthwise through core. Brush with remaining 1 tbsp. oil and season lightly with salt. Husk corn and remove any silk by rubbing ears with a kitchen towel. Rub sparingly all over with chile butter (about 1 tsp. per ear; dripping butter will cause flare-ups). When chicken is browned, remove plates and turn pieces over. Through hinged flap of cooking grate, add several more coals from second chim­ney to replenish fire (keep heat at medium). Cook chicken, covered, until an instant-read thermo­meter inserted through thickest part reads 155°, 15 to 20 minutes more. Transfer to a cutting board. Add corn to grill and cook over medium-high heat (450°; you may need to add a few more coals or wood chunks), covered and turning often, until charred in spots, 5 minutes. Remove from heat, cut into thirds, and rub with more chile butter while still hot. Put in a serving bowl. Grill lettuces on both cut sides over medium-high heat until grill marks appear, about 10 minutes total. Arrange on a platter. Carve breastbone and ribs from each piece of chicken (leave drumette attached). Set chicken on top of lettuces and serve with corn and remaining chile butter on the side. Cut the first two joints off each chicken wing, leaving only the drumettes. Cut the leg quarters off, leaving as much skin intact as possible over the breast. Use kitchen shears to cut out the backbone and neck, following the chicken's natural fat line. Score down the center of the breastbone with the point of your knife, then cut in half through the bone. After grilling, slice away the breastbone and ribs. Make ahead: Up to 1 day, season chicken; chill.